A demonstration of the Submarine Combo. The Submarine Combo, known as the Submarine Combination (サブマリンコンビネーション Sabumarinkonbinēshon) in Japan, is a move performed by Sonic the Hedgehog and Miles "Tails" Prower together in Sonic the Hedgehog 4: Episode II. It is a Tag Action performed while jumping underwater, allowing Tails to carry Sonic through water. 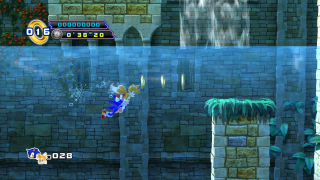 Once the player has reached a certain point in Sylvania Castle Zone Act 2, the player can press / while jumping underwater to make Tails start carrying Sonic, then propel himself through the water. Unlike the Copter Combo, this move has no limit to its use, allowing Sonic and Tails to swim through the water until they exit the move by pressing the Tag Action button again. However, Sonic and Tails can still drown, and they are suspectible to damage from Badniks and hazards. If the two come into contact with an air bubble while using the Submarine Combo, the bubble will be shared between both characters. When using this Tag Action in Multiplayer mode, Tails' movement is controlled by Tails' player. This page was last edited on 22 May 2018, at 17:47.